One of the most important occurrences everyday in my home is my son's potty schedule. Most days you will hear loud claps, cheers and a big sigh of relief (from me). On other days, some pleading, crying, and an anxious mother who will not rest unless I hear my son utter the magic words which indicate that bowel movement has been accomplished. If your child has ever suffered with constipation, you will understand why 'potty time' is such a big and important accomplishment everyday. My son sometimes has trouble passing stool but an incident when he was about a year and half, left us certain that we never wanted to see him in such pain and discomfort ever again. Constipation, I have learnt is a common digestive problem in babies and toddlers. 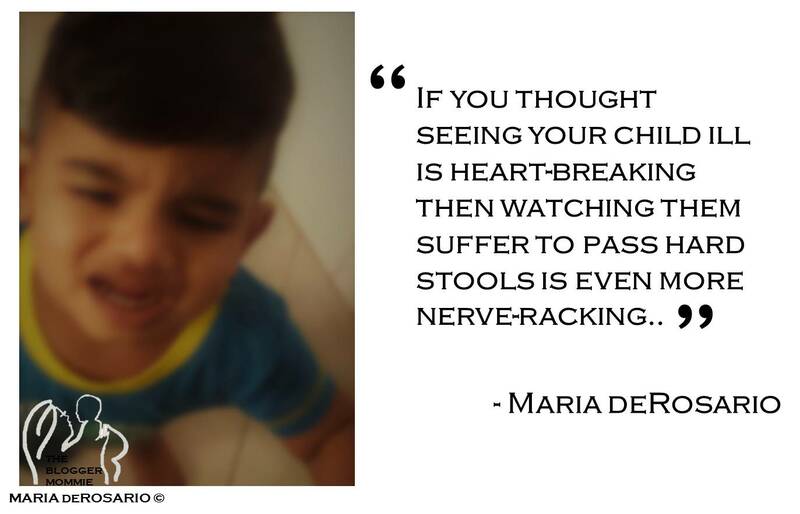 For my son, It began when he started solids at six months and if you thought seeing your child ill is heart-breaking then watching them suffer to pass hard stools is even more nerve-racking. The signs of constipation are quite obvious: I know my son will have trouble when he hasn't had proper bowel movements for two days. So instead of waiting longer, I began to make note of the reasons why this was happening. The first step to tackle this situation was to understand the cause of such digestive problems. All of the above have been the biggest challenges as I tried to treat my child's digestive problems. As a baby, it was much easier to include high-fibre and whole grains in his diet but as his taste improved, he became extremely choosy about what he wanted to eat. Getting him to eat fruits and vegetables was complicated enough. Trying to convince him to eat the ones that would help boost his digestive system was even more challenging. He disliked juices, was picky about eating fruits like pears and plums that are rich in fibre. Offering them as delicious smoothies worked one day and failed the next. So after talking to a few other mom's and my own, I began to follow some remedies that has helped to improve my son's digestive problems as he's grown. 1. A cup of warm milk or water every morning: Beginning the day with a warm cup of milk every morning has been successful in getting the bowels moving. Establishing this routine has been important because irregular bowel movement was a sure sign that my son would be crying in pain when he had to pass stool. If he refuses milk, I offer him a cup of warm water instead. 2. Drinking plenty of fluids: as a baby my son loved water. As a toddler, I have to constantly run behind him to ensure he's well hydrated. Keeping a sipper of water within his reach with frequent reminders have helped build this habit and while I still need to keep reminding him, he understands the importance of this practice. 3. Raisins soaked in water: this is a tip that has been passed on and worked for several kids in my family. A couple of times, when my son suffered frequent constipation, this worked wonders. I soak three to four raisins overnight in a bowl of drinking water and offer the (warm) water to drink the next morning. 4. Adding a spoon of ghee: recent research has revealed several benefits that healthy fats like ghee offer. Since my son turned one, I have always added a spoon of ghee to his afternoon meal and while cooking certain dishes. If anything, it enhances the taste of the food and makes it highly pleasing. 5. A diet rich in high-fibre foods: as mentioned earlier, getting my son to eat a lot of the fibre-rich foods is still a work in progress. Some foods I have managed to incorporate in his diet include: lentils like dal and chickpeas, almonds, green peas, fruits like banana and berries. These foods are served in curries along with rice, as snacks and as side dishes and the added spices help in quickening bowel movement. There are several wholegrain cereals, fruits (like apple, pear, prunes), vegetables like sweet potato, coconut and cabbage that help prevent constipation. Depending on your child's food choices, these can be added in the daily diet in adequate proportions. These remedies are just suggestions to ensure proper bowel movement every day and have worked really well for my son. 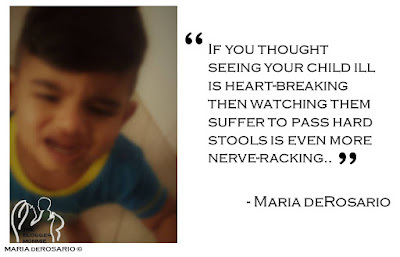 In case you are ever in a situation like I was: a child screaming in pain because of a hard stool don't panic but focus on helping your child get through the moment. Have your child squat and take deep breaths in between- this is the only thing that worked in my situation but don't hesitate to contact your doctor if nothing works. Remember: It's important to always mention and discuss all digestive issues with your child's doctor because there could be additional factors that cause constipation or other digestive issues. I hope you find this article helpful. Do comment and share how you've managed digestive issues with your child and any tips that have worked well. Thanks for taking the time to read. Teaching my Child to Share... or Not?